A little while ago BurdaStyle.com suggested sewers from around the world take up the initiative to meet up and sew together socially. They launched the BurdaStyle Sewing Clubs and its own network on ning.com on meetup.com and encouraged members to take charge and start a club with their support. 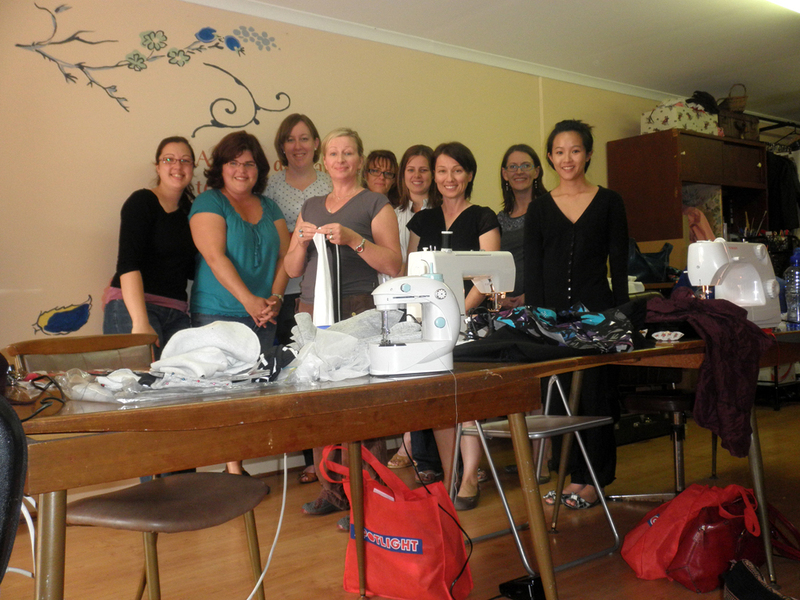 The BurdaStyle Sewing Club of Perth, Western Australia was founded by Sandra and myself and is now run by a collective of super talented ladies. They meet once a month in Malaga and are always looking for new members so jump on over to their meetup page and sign up or email Sarah at bscperthwa[at]gmail.com and she’ll help you get started. They also have a blog so feel free to pop on over and check out what they’ve been up to lately. Tehy will look forward to meeting you soon. What is a BurdaStyle Sewing Club? Traditionally, sewing has been a social activity. Before the convenience of ready-made clothes and large shopping malls, mothers would teach their daughters how to create and mend clothes for themselves and the entire family. Sewing was a necessity, and thus communities gathered around to ensure that this skill was widely known. BurdaStyle believes that sewing is still best as a communal activity, and we encourage this with our Sewing Clubs. A BurdaStyle Sewing Club (BSC) is a group that meets regularly to discuss sewing related issues and each one is uniquely tailored to fit its members. Members of all skill levels come together to refine their craft and share the joys of sewing with similarly passionate people. BSCs are centered around each group’s unique schedules, and can meet weekly, bi-weekly or monthly. The clubs are simply a way to bring our online community offline and, like our website, is intended to be versatile for a wide range of interests and lives. They promote our open-source philosophy: the idea that information ought to be shared freely among anyone interested in learning. The BurdaStyle Team is on hand to offer advice regarding meeting ideas, venue options and promotional help. What if you’re not in Perth? Well that’s ok, BurdaStyle clubs are all over the world, check out the meetup page or the current list of clubs to find one near you, or better yet, BurdaStyle clubs are on Google Maps, click the image below and simply zoom around the world to find your closest club. Hi, I am thrilled to find a Burdastyle sewing group. I have been using Burda since 1963 and still have most of my magazines going that far back. Last summer I made a couple of shift dresses using them. I only buy the odd current magazine now as I find them hard to track down . If I can justify making 3 garments then I will purchase I find an annual subscription too expensive. I use Burda almost exclusively.